Lau doing what he does best, catching fists with his face. Virtua Fighter 2 is an arcade sequel turned console port back in the day of 1995. With its initial console release being on the Sega Saturn, developer Sega has brought us a blast from the past with their latest re-release on Xbox Live Arcade. It’s pretty much standard fare here, as all of the punch, kicks and blocks return in their original form. Just as they did back in 1995, the controls feel fast and immediately responsive. Trying to piece together a combo consisting of more than just a few hits is still just as much of a challenge as it was back then; and the dominating player will be the one that has learned to juggle their opponent the best. Jumping feels a bit off, because simply pressing up will usually send your character skyward in such a way it is unbelievable still, and the floaty gravity usually results in meeting a foot to the face upon landing. Not everything returning from 1995 can be a good thing. Although the graphics definitely had something going for them back then, sadly there is little to no cleanup to be seen in this release (even with 2.1 activated); though it should be noted that it was never really meant to be anything more than a “re-release” and not the “HD update” we’ve become all too familiar with recently. Just as it was back in the day, Virtua Fighter 2 continues to be an absolutely great fighting game. Sadly, finding an opponent online took ages, and when I did find one the connection (mine or his) made it a touch difficult to have an engaging battle. As such, I fully recommend playing this with a friend on the couch (as it was meant to be) as opposed to trying to give this new-fangled internet a try. Online or Dorito-munching couch buddy, the fighting is still fast and simple. Each round can be won in one of three ways: health depletion, time out or, my personal favorite, the ring out. Sending your opponent helplessly flying through the air with half of their health left only to know that you’ve sealed the deal by knocking them out of the ring is a satisfaction rarely encountered in many fighters these days (aside from the other Virtua games, or even the Soul Calibur line). There are plenty of options to customize your gameplay, such as round count, time limit and the amount of health each player starts with. You can also pick between 2.0 and 2.1 versions; the difference being slightly tweaked combat speed and visuals are cleaned up just a tad. 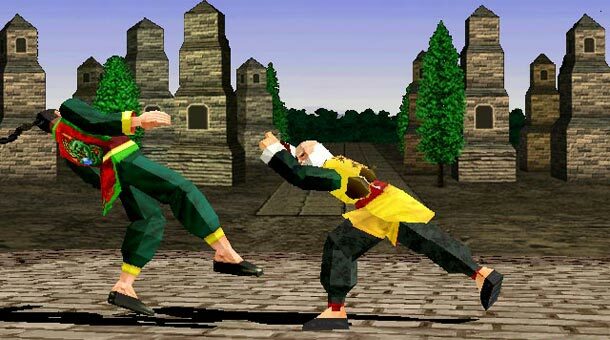 Today there is no shortage of great fighting games to choose from, and Virtua Fighter 2 kind of gets lost in the crowd due to archaic mechanics and graphics. For a completionist or a diehard fan, fun and nostalgia will be rampant with this purchase, but I don’t truly expect Sega to sell millions of this due to its status as a mere port. Maybe a Virtua Fighter 2 HD release would grab some more dollars, Sega? Hint, hint.